Painting V. A. Serova “Winter” was written in pastel, gouache in 1898. This is one of the best works of the artist. Country nature accustomed to Serov. Open space is bordered by a forest on the horizon, in the foreground stands a low-key shed. From behind the shed go horse-drawn sleigh. The sled movement allows you to enjoy the moment captured by the artist. Softness in execution, muted paint, a complex combination of gray, brown and white colors, all this gives a feeling of a quiet and calm winter day. The simplicity of the image, and the small forest in the distance, the sleigh drawn by a horse and the shed in the foreground convey a great deal of meaning. Here you can see the deep meaning conveyed by the artist’s painting. The white-gray scale, numerous halftones and complex execution will not allow to dryly list the contents of the picture. Here the artist emotionally conveys the literary image of the village and the villager of the time. This quiet tranquility, the winter dream of nature, and this image is conveyed through the skill of the artist. 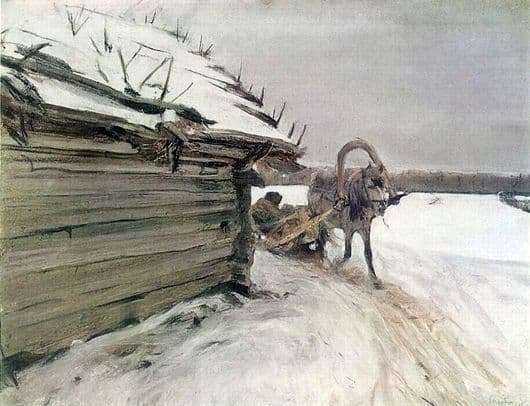 Landscape “Winter” – is an example of skill Serov. Here you can assess the accuracy of the transfer of wood shed, forest, seen in the distance, snowdrifts in the field, and trampled and buried snow on the road. It’s amazing how exactly the forest is depicted, quiet calm, because this is exactly what the village looks like in winter. Each element of the picture is made easily, but it carries its own, semantic load. After the appearance of the picture, it has a great response from Russian artists, and has a strong influence on the development of the landscape. The landscape is made in Domotkanov. He was exhibited in 1899 in St. Petersburg with the name “In the Village”. The picture is in the State Russian Museum.